Visiting the little coastal towns of Tomakin, Mossy Point and Broulee is like stepping back in time, writes BEN CADDAYE. NESTLED between Batemans Bay and Moruya on the NSW Far South Coast, the sleepy little towns of Tomakin, Mossy Point and Broulee provide a snapshot of what seaside life was probably like in the majority of coastal villages in the 1960s and ’70s. Largely undeveloped and off the main tourist trail, Mossy Point, Tomakin and Broulee are “blink-and-you-miss” towns that most people whiz by on their way to larger centres to the north and south. But for those who stop for a moment to soak up the slow pace of these laid-back villages by the sea, it doesn’t take long to realise that all three are within the vicinity of some pretty fishy real estate. They are three hidden gems that offer anglers easy access to excellent estuary, beach and rock fishing. Better still, because this section of the coast is a little off the beaten track, anglers who base themselves here often have the best fishing spots all to themselves. The small but picturesque Tomaga River divides Tomakin and Mossy Point and, from an angling perspective, is the only estuary option in the immediate area. The much smaller Candalagan Creek, which divides Broulee and Mossy Point, is a sanctuary zone and off-limits to all fishing. The Tomaga River begins as a trickle a short distance away at Mogo and winds its way for about 9km past the popular Mogo Zoo before spilling into Broulee Bay. I have fished the river on and off for 20 years. While it never grabs the headlines like larger systems in the area, it has always been a reliable place to land a bag of sweet-tasting whiting or flathead. It also produces excellent numbers of bream, blackfish, trevally, garfish and flounder. The river copped a flogging from commercial netters in the 1990s and the early part of the new millennium and the fishing suffered. But since becoming a Recreational Fishing Haven it has bounced back and is a very handy and under-rated little fishery. Because its upper reaches are very shallow and hard to navigate in all but the smallest of craft, the majority of fishing occurs in the short stretch between the mouth and the Goldfields Caravan Park. Here sandflats, ribbon weed, rock bars and drop-offs are home to good populations of flathead, whiting and bream, especially in the warmer months. Flatties and bream can be caught by casting soft plastics from a drifting boat on the run-out tide, focusing on areas of broken sand and weed in about 1-1.5m of water. A 65mm Squidgy Fish in Black and Gold or Wasabi is likely to undo a lizard or two. For bream, try a lightly-weighted 65 or 80mm Squidgy Wriggler in Bloodworm. Poppering the shallow sandflats for whiting is becoming an increasingly popular technique within this little system. 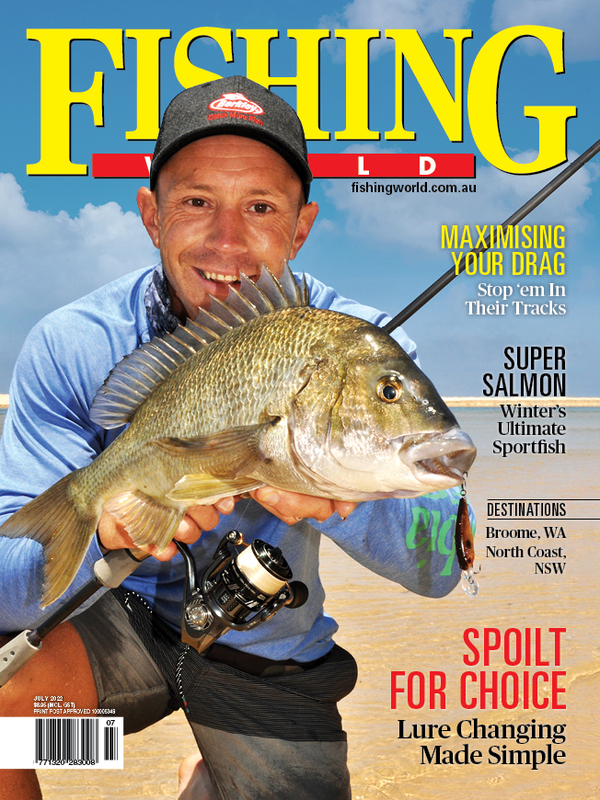 In nearby estuaries more heavily fished with poppers in recent seasons, such as Tuross and the Moruya River, it seems the whiting are quickly wising up to poppers and are noticeably much harder to catch than in previous years. That hasn’t happened yet in the Tomaga, with the flats and ribbon weed beds towards the river mouth yielding lots of popper-loving whiting as well as bream and flathead, especially when the water temperature creeps over the 20-degree mark. Focus on early and late in the day when crowds are thinner as boat traffic tends to have a profound impact on fish in this waterway. The lower reaches of the river are also very accessible and quite productive for land-based anglers. The sandflats on the Tomakin side of the river are a haven for whiting, small flathead and bream. Kids can fish safely in this area and expect to catch a fish or two to boot. Equip them with a light outfit and a beachworm or nipper bait, and the fish should do the rest. The more serious angler can wade the shoreline with soft plastics and snare flathead and flounder. The reefy area adjacent to the boat-ramp at Tomakin is a very productive location for blackfish on either green weed or nippers. If you pick your tides, the upper reaches can be navigated with care in a kayak or small boat. Use the flood tide to push up past the Goldfields Caravan Park and you will find oyster leases, snaggy banks and a few deep holes which all harbour some excellent fish, mostly bream, flathead and the occasional estuary perch. I’ve hooked (and lost) some monster bream in the upper reaches by casting Ecogear SX-40s into the timber. Big flathead lurk up here as well and anglers will get them on hard-bodies and soft plastics. This stretch of river also snakes its way close to the Mogo Zoo, so don’t be surprised if you hear the occasional roar of a lion or spot a giraffe in the distance through the eucalypts! Tomakin, Mossy Point and Broulee are virtually within casting range of a number of very productive surf beaches. Barlings Beach, Tomakin Beach, North Broulee Beach and Bengello Beach are typical of stretches of sand in this part of the world, producing a broad variety of species year-round. Summer is prime time, with fat whiting, solid bream and flathead available alongside the usual run of tailor, salmon and the occasional school mulloway. Barlings, Tomakin and North Broulee are relatively sheltered beaches with little in the way of obvious features. However, the small gutters and holes that do appear from time-to-time are well worth exploring for whiting, bream, flathead and salmon. The whiting and bream fishing in particular can be extremely good in summer and autumn; they key ingredient is fresh bait, usually in the form of live beachworms, nippers or fresh pipis. Fish on the rising tide and focus your efforts on first and last light. Bengello Beach, in stark contrast, is exposed and windswept and the pounding surf is constantly shaping new gutters and holes. Separating South Broulee and the Moruya Breakwall, it is a highly productive beach for all surf species and produces massive tailor, jumbo salmon, huge whiting and bream, solid flathead and a few nice mulloway and sharks. Again, live or very fresh bait is the key, especially if you’re after bream, whiting or mulloway. Tailor and salmon, on the other hand, will respond readily to whole or half pilchards or metal slices retrieved through the many gutters and channels. Tracks into this beach are located off George Bass Drive. Alternately, anglers can park at either end and walk to likely looking gutters and holes. The headland at South Broulee is the most prominent rock platform in this area and is, without doubt, the most popular with anglers – and for good reason. This flat, relatively safe chunk of rock juts out into the northern end of Bengello Beach and is a renowned land-based spin location for tailor, salmon, bonito, frigate mackerel and even small kings. Towards the bottom of the tide, anglers can toss lures for these pelagic species, with late evenings and early mornings the prime times. Spanyid Raiders (25g and 40g) worked in the wash zones will tempt fish at all times of the year, but expect the best action to occur between Christmas and June, when water temperatures are at their highest. Anglers fishing with cunje, peeled prawns or small crabs also have the chance to battle with some sizeable rock blackfish and blue groper. Note that this headland, while very safe and accessible at low tide and on calm days, can become dangerous in a southerly swell and a rising tide. Always check tides and weather conditions before fishing here and you will have a lot more fun. Nearby Broulee Island, which is now permanently connected via a sandspit to the mainland, once offered many more rock fishing options but is now largely a sanctuary zone. Small pockets are still fishable but check the Batemans Marine Park map before you wet a line. There are lesser-known rockhopping locations in the area, mainly around Mossy Point, beyond the entrance to Candalagan Creek. Access to these rocks is difficult and they can be very dangerous in even moderate seas. While not many people fish here, tailor, salmon and bream can be caught in reasonable numbers. Be very careful if you fish this area! THE adjoining towns of Tomakin, Mossy Point and Broulee are located on the NSW Far South Coast, about two hours’ drive from Canberra (4hrs from Sydney). These three sleepy little villages are about 15 minutes south of Batemans Bay via George Bass Drive or the Princes Highway. All three towns have small shops and/or general stores, selling basics like bread, milk, take-away food and bait, but the majority of services are located either north at Batemans Bay or south at Moruya. Accommodation is limited but there are a number of very good caravan parks, offering on-site vans, cabins and tent sites. SUMMER tends to be the best time to sample the fishing on offer in the Tomakin-Mossy Point-Broulee areas. The Tomaga River fires from December, with flathead and whiting especially active. Similarly, the beaches kick into gear around the same time, with whiting and bream prevalent. Rock fishing for salmon and tailor is good before Christmas, but the pelagics don’t usually arrive until February. Squid fishing can be very good in December. AUTUMN, from a fishing perspective, is arguably as good as summer in this part of the world – perhaps even better. It’s certainly the best season for rock fishing, with small kings, bonito, frigate mackerel and even a few tropical species biting alongside the usual run of tailor and salmon. The beaches fish very well for all species right up until late April, and you can catch flathead, whiting and bream in the river throughout autumn. WINTER sees action in the Tomaga River slow dramatically. Anglers will still catch nice bream and blackfish on nippers, but the best action continues to unfold off the rocks. Salmon, tailor, drummer and groper are all worth targeting from the stones. June is a reasonably productive month for bream, tailor and salmon in the surf, but the action tapers off as the water cools. SPRING fishing can be very sluggish in August and September, especially if the wintry weather hangs around. The first burst of warm weather, which usually occurs in late September or October, is often a good time to try for an early season flathead in the river. August can be a very good month for drummer and groper from the ocean rock platforms.